Since I have a food blog, Sidewalk Shoes, I cook usually 5 nights a week, which means we eat out 2 nights a week. One of those nights is usually a restaurant that we have been wanting to try and the other night is usually a favorite regular. 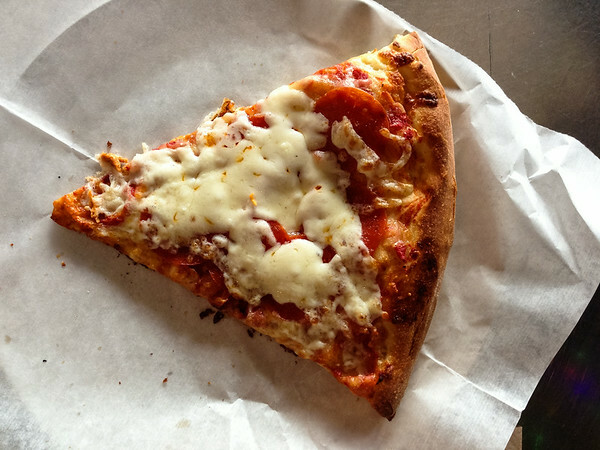 One of our very favorite regulars is Lupi’s Pizza Pies. This (the Hixson location) is our Friday night eats choice. It is halfway between our home and Mr. Grey’s work, so I drive in, he drives out, and we meet in the parking lot. Being creatures of habit, our order is always the same, the only varying is Mr. Grey’s choice of brew. We each get a salad, a slice of pizza and a drink. When you walk into Lupi’s, you place your order at the counter. We try to get there right before 6, so that it is not too crowded. Standing in line to place your order drives me crazy, but I have learned to live with it. It’s really annoying when you get behind someone who waits until they get to the counter to begin looking at the menu and discussing all the options with their members in their party and the counter person. But when you make it to the counter, the people are extremely friendly and knowledgable, even giving a sample taste of a beer if you are not sure what kind you want. Once you place your order, you find a table and place your number on the table for the server to find you. If you’ve gotten tea or soft drinks, you go to a counter and fill them yourselves, allowing multiple refills. While you wait for your order, you can look around and admire the eclectic decor. Dark purple walls with bright trim colors, big puffy clouds hanging from the ceiling, string lights hung from anything and everything. There is artwork on the walls for sale, a small outdoor seating area, and a small game area. 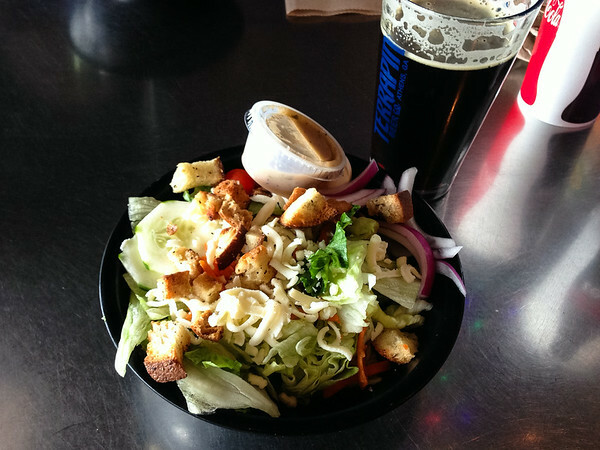 I know it may sound strange, but the salad is the reason we go to Lupi’s. It’s perfect. It has lettuce, tomatoes, cucumbers, sprout, cheese, red onions, shredded carrots, and the best croutons ever. I could live on the croutons alone. We get the house balsamic vinaigrette. The pizza is good. We like that we can order it by the slice. I get pepperoni on white dough with extra cheese. 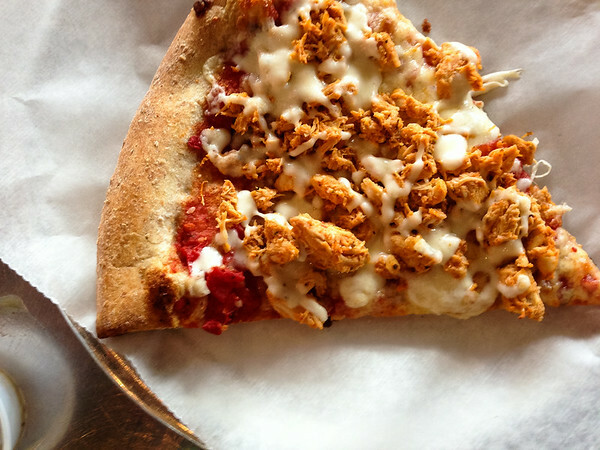 Mr. Grey gets spicy chicken on whole wheat dough. Unlike the salads, the pizza is unremarkable. It’s good, but it doesn’t stand out from other pizza places the same way their salad does. The marina sauce is flavorful, and depending on who is making the pizza, my extra cheese is sometimes really extra and sometimes not so much. I must make one last statement about the Hixson location, I don’t know if it applies to the others or not. 90% of the time when we go there everything is great from the service to the food, but that 10% of the time when something goes wrong, it really goes wrong. I don’t know if it was when a specific person was working there, or if they just get short-handed sometimes, but it can go downhill quick. Our first clue is usually how crowded it is. They aren’t getting the turnover they need to free up the tables, on those nights there have been people standing around holding their numbers and their drinks waiting for a table to open up. Our second clue is that we are handed a pack of crackers with our salad instead of croutons. Since the croutons are one of the main reasons we get the salad, this is very disappointing and it doesn’t bode well for the service. But like I said this only happens every once in awhile, so I wouldn’t let it deter you, it doesn’t us. We live pretty close to this particular Lupi’s and we eat there every now and then. I don’t think I’ve ever tried their salads, but I love their fresh-baked bread. I could probably eat a whole loaf by myself! The pizza is ok. Topping selection is great. I love their roasted corn. I wish their crust was crispier. My problem is I will always compare the pizza we have back home (Eastern Europe) and the one in Italy with American pizza. I like a more firm crust, one that does not require fork and knife. But, that’s just me. I guess I’m just not a huge fan of American pizza 🙂 That’s why I make my own pizza at home, about once a month.